So if you step out of our hotel doors and walk for just a few minutes, what can you do? What’s possible to experience when only staying in Mayfair? Mayfair has generated a rather positive following over the years as an international art hub. The Royal Academy of Arts, the Fine Art Society and the Handel House Museum are all based within Mayfair, whilst there’s also Faraday Museum gives you the opportunity to view the actual laboratory used by famed scientist Michael Faraday in the 19th century. Plus, there are brilliant art galleries such as the Halcyon Gallery. Established in 1982, it focuses squarely on contemporary artists and has housed exhibitions from some particularly notable names – in fact, this autumn it’s playing host to a number of pieces from Bob Dylan. The popular auction houses of Bonhams, Sotheby’s and Christie’s are all located within the Mayfair boundaries and have been established in the city as providing fine art and antiques of a very particular quality since the late 18th century. A truly British experience, the auction houses are generally open Monday to Friday with some weekend activity and although open to all, all three are renowned for their high end sales, so a credit card with a large limit may be required! With numerous luxury shops dotted throughout Mayfair, the most popular retail destination for many in the area is the Burlington Arcade. 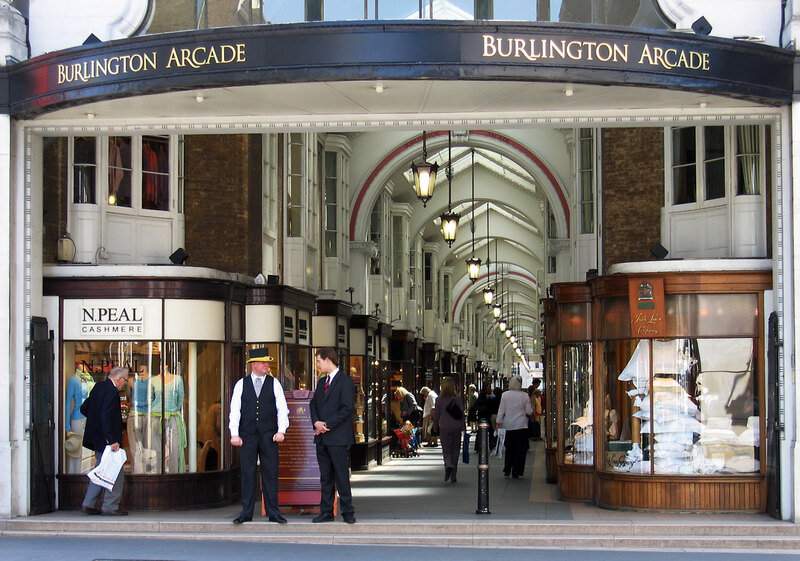 One of the first arcades in the city when it opened in 1819, it has retained much of its original feature and charm over the last 200 years. Traditionally known for providing high quality silver goods, these are still available today, but you’ll also be able to partake in a spot of retail therapy with clothing, footwear, art and antique outlets, too. It’s a huge privilege to work with a number of Royal Warrant holders here at DUKES. Issued for centuries to people and companies who supply goods and services to the British Royal Family, gaining a Royal Warrant is still seen as a huge pat on the back in 2018. It shows that the highest members of our Royal Family enjoy the products and services on offer. And the good news is when you’re in Mayfair, you can sample what the Royal Family love. For example, Truefitt & Hill are located on 71 St James’s Street and have been providing some of the highest quality shaving products to men in London for over 213 years. Although only a small part of London, there is such a huge variety of places to eat in Mayfair that you’ll be spoilt for choice. Including our own GBR – Great British Restaurant – it’s a true hit with our hotel guests for breakfast, lunch and dinner, but we’re open to non-guests, too, allowing everyone to sample the wonderful food from our chefs and unbeatable service from our waiting team. Appreciating it’s good to try other eateries, the ever-popular, two-Michelin star Le Gavroche is located within Mayfair, as is Iran Restaurant, which offers a taste of the Middle East and Bar Reno, a much loved Italian restaurant. Varying in styles, budgets, atmospheres and tastes considerably, there’s one thing that is guaranteed – you’ll be able to find somewhere to suit your culinary tastes within Mayfair. There’s something particularly appealing about Mayfair. It could be that whilst it’s developed, it’s managed to retain its original charm (something that could be attributed to the lack of buses and tubes running through the area) or conversely, it could be because it has developed so much that every need is catered for. And being in the heart of it, we have arguably the best location to explore Mayfair – and wider London – from. What more could you want than being just steps away from some of the most luxurious offerings in the country?